Personalised three piece bath towel gift set. 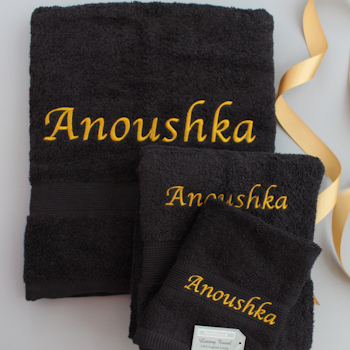 Personalised three piece bath towel gift set. A personal and unique gift in your choice of towel colour. Popular for birthday or anniversary gifts and even a great housewarming gift. Matching set of towels - Face Cloth, Hand Towel and Bath Towel. This bath set is super soft cotton. You select which colour towel set you want too. Personalised with a name or initials on each piece in your choice of thread colour and letter font style. Amys Gifts embroidery is especially made to order and we do our best to get orders dispatched within 2 days.